Could Mars, of all places, be the place to look for early life on Earth? It's an intriguing thought and one that astrobiologists take seriously as they consider the conditions during the early days of Solar System when both planets experienced frequent bombardments by asteroids and comets that resulted in debris exchange between one body and the other. "We might be able to find evidence of our own origin in the most unlikely place, and this place is Mars," planetary scientist Nathalie Cabrol of the SETI institute said in a TED Talk in April 2015. Cabrol studies life in extreme conditions on Earth with the hope that her research might help improve the search for signs of life on the Red Planet. "We can go to Mars and try to find traces of our own origin. Mars may hold that secret for us," she said. "This is why Mars is so special to us." Mars orbits an average of 140 million miles (225 million kilometers) from Earth and has a similar size and composition. During the period of the Late Heavy Bombardment, about 3.8 billion to 4 billion years ago, the planets were pummeled with asteroids and comets, which may have also provided the water to much of the Earth's oceans. Earth and Mars were, in a sense, connected to each other by the violence of this era. "Earth and Mars kept throwing rocks at each other for a very long time," Cabrol said. If life spawned on one planet, it could have clung to one or more of these samples and traveled to the other, a process scientists call panspermia. But if early Earth life did make it to Mars, it would have needed a hospitable arrival. Today the planet is bleak and barren, resembling the Earth's most desolate deserts. With its thin atmosphere and almost completely waterless surface, any life that landed on Mars today would have a difficult time taking hold. 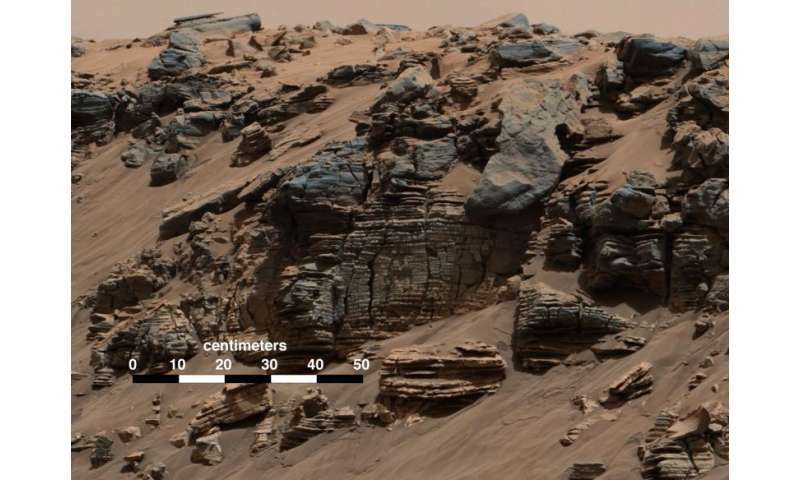 But in the past, when the rocks were flying, Mars likely boasted a more habitable environment. "At the time when life appeared on the Earth, Mars did have an ocean, it had volcanoes, it had lakes, and it had deltas," Cabrol said. Yet unlike Earth, the Red Planet quickly lost its hold on habitability. "When life exploded at the surface of the Earth, then everything went south for Mars," Cabrol said. Because Mars lacks a protective magnetic field, the Sun's solar wind stripped it of its atmosphere and exposed the surface to bombardment from cosmic rays and ultraviolet (UV) light. Most of the water left the surface, escaping into space. Only a few pockets remain on the surface today, at the poles, while some water may lurk beneath the ground. "There is no life possible on the surface of Mars today, but it might still be hiding underground," Cabrol said. To understand what life might have done as the planet's situation grew more bleak, Cabrol said scientists need the ability to peer back at the Mars of the past. "You only need to go back 3.5 billion years ago in the past of a planet," she said. "We just need a time machine." Today, Cabrol uses Earth as her time machine, traveling to regions that resemble the Red Planet in its past. "I use planet Earth to go in very extreme environments where conditions were similar to those of Mars at the time when the climate changed," Cabrol said. One of those regions lies at the top of the Andes Mountains in Chile. 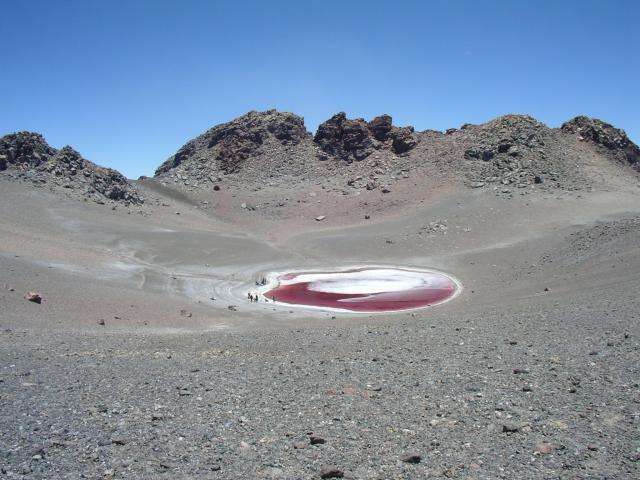 Volcanic lakes fill the cone of the volcano, making it a unique analogue to Mars. The region is situated at an elevation of 3.6 miles (5.872 km), where UV rays more easily pierce a thin atmosphere. Cabrol traveled there as part of the High Lakes project, funded by a grant from the NASA Astrobiology Institute (NAI) element of the Astrobiology Program at NASA. 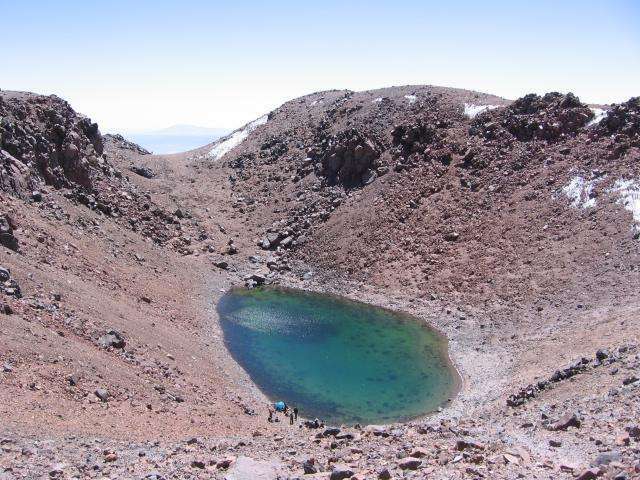 "At this altitude, this lake is experiencing exactly the same conditions as those on Mars three and a half billion years ago," Cabrol said. 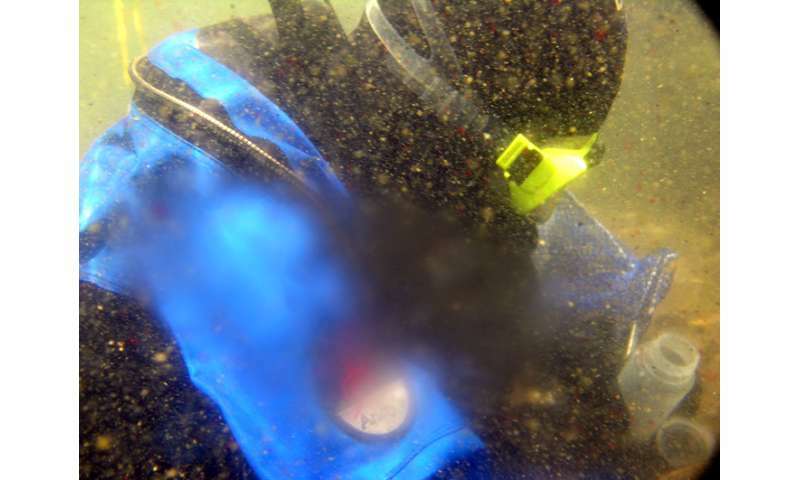 Cabrol and her team changed from mountain climbing equipment to diving gear to sample the interior of one such lake. They found that "life is everywhere, absolutely everywhere," she said. Yet the amount of life in the lake can be deceiving. According to Cabrol, 36 percent of the samples her team took home were made up of only three species, typifying the deadly environment. "There is a huge loss in biodiversity," she said. "Those three species are the ones that have survived so far." If life exists on Mars, it is likely to be similarly lacking in biodiversity. Only the hardiest microbes may have survived the planet's decline. In another nearby lake, similar conditions have driven the algae within to adapt, giving the water a reddish cast. On Earth, a score of 11 in the UV Index, which provides a forecast of the expected risk of overexposure to the Sun's ultraviolet radiation, is considered to be extreme. During UV storms, the UV Index at Aguas Calientes lake can reach as high as 43, the highest UV radiation levels measured on Earth. The water is so clear that the algae have nowhere to hide from the deadly radiation, so they must find other ways to protect themselves. "They are developing their own sunscreen," Cabrol said, "and this is the red color you see." 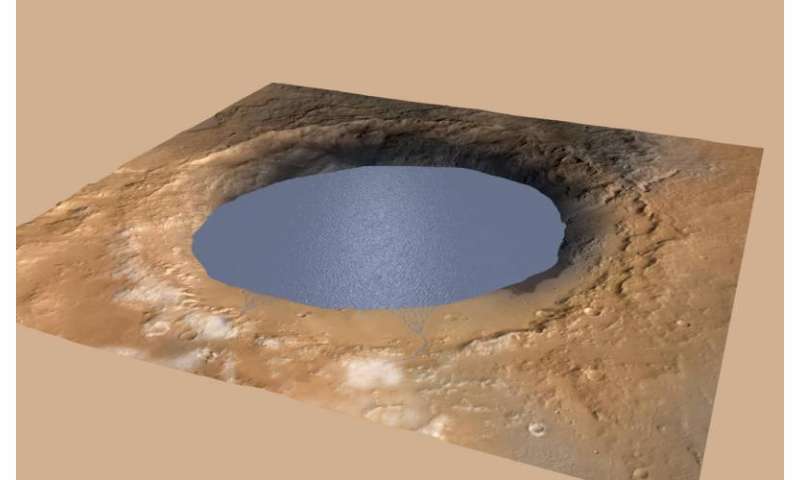 While the lakes give some insight into what could be happening on Mars in the past, they don't suggest what could have happened to organisms on the planet when there were no pools left to hide in. "When all the water is gone from the surface, microbes have only one solution left—they go underground," Cabrol said. In addition to studying pools at high altitude, her team also examined microbes that seek shelter from the Sun's radiation. Cabrol showed images of semi-translucent rocks with microbes hiding beneath, while still taking some energy from the Sun. "They are using the protection of the translucence of the rocks to get the good part of the UV, and discard the part that could actually damage their DNA," Cabrol said. Studying these organisms can help scientists searching for life on Mars with rovers such as Curiosity. "If there was life on Mars three and a half billion years ago, it had to use the same strategy to actually protect itself," Cabrol said. Mars isn't the only place life might thrive in the Solar System. Scientists think a subsurface ocean could exist on Jupiter's moons Europa and Ganymede, and on Saturn's moons Titan and Enceladus. Cabrol develops science exploration strategies for these icy moons, where microbes may have evolved. Unlike Mars, other bodies in the Solar System would have had a more difficult time exchanging material. "Mars and Earth could have a common root to their tree of life, but when you go beyond Mars, it's not that easy," Cabrol said. "If we were to discover life on those planets [and moons], it would be different from us." Extraterrestrial life in the form of microbes, should it be found, may not lead to an equal exchange of intelligence, but primitive life can still answer questions about the existence of life, Cabrol said. "Organic material is going to tell you about environment, about complexity, and about diversity. DNA, or any information carrier, is going to tell you about adaptation, about evolution, about survival, about planetary change, and about the transfer of information," she said. "All together, they are telling us why what started as a microbial pathway sometimes ends up as a civilization or sometimes ends up as a dead end." Within our solar system, these questions could be answered in the not-too-distant future, she said. "This can be achieved by our generation," Cabrol said. "This can be our legacy—but only if we dare to explore." Earthlings, NASA send toast to Martians: Happy New Year! Is life on Mars related to life on Earth? I wonder what about Venus? Didn't Venus have a more Earth-like atmosphere way back? Might it have exchanged rocks too? Venus may have exchanged rocks as well, but it would have been totally resurfaced and baked, so don't expect to see any remains of life on Venus. Interesting how Benner et al bottom up theory (apriori simple beginnings, a posteriori complex chemistry) gets Mars as the likeliest emergence place - benefits from a large pre-Noachian continent. While Russell et al top down theory (a posteriori likely beginnings, apriori complex geochemical systems) gets Earth - benefits from a large Hadean ocean. It is possible that Bacteria and Archaea split before the DNA and chemiosmosis systems were finalized (different replicases, different membranes). Possibly because their ancestors freed themselves from depending on vents for replication (already with RNA replicases for an RNA/protein cell) and metabolism (chemiosmosis can only arise in alkaline hydrothermal vents according to Lane et al) on different sides of the planet. That would promote indigenous life twice over martian such, with the need for vents and more likely a local split than two times transpermia. Mars needs about half the escape velocity, is closer to the asteroid belt, and the ejecta is preferably transported inwards. Also, Mars was a planet ~ 100 million years before Earth (but not Venus) due to the Great Impact that made the Moon. For these reasons people think the transport, especially any transpermia transport, was from Mars to Earth, and less so in other directions. But Cabrol is wrong too. When people have modeled transpermia under 4 billion years they find that Earth can have seeded life all the way out to Enceladus. (~1 suitable ejecta piece has landed there.) So if we find any life from there and in, we do need to see clear differences in genetic machinery to start wondering if it isn't ours. And possibly one can start thinking of two step contamination if it looks to be our relatives, reminding of Alfvéns original panspermia hypothesis. What if we had a powerful telescope that could see the image of our solar system reflected off of a reflective surface from the past? If every image we see of far away galaxies is from the past, then if we saw a reflective image of our own galaxy from the past, would it be from the past? "Mars needs about half the escape velocity, is closer to the asteroid belt, and the ejecta is preferably transported inwards. Also, Mars was a planet ~ 100 million years before Earth (but not Venus) due to the Great Impact that made the Moon. " Where did you read these fantasies? In "Top secret" magazine?